The Fraternity of Gardeners of East Lothian was in existence as early as 1676. 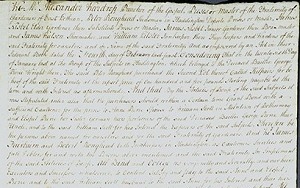 On 16 August of that year a surviving minute book records the organisation's constitution, which clearly lays out the aims and intentions of the body. Article Quatro (four) states a 'sufficient Quorum of the Fraternity appointed' shall examine any 'professing to be handie labouring and working Gardeners' 'that noblemen, Gentlemen, and others may be sufficiently served with well qualified Gardiners'. The rest of the 15 rules stipulate the fraternity's administration, regulate members' behaviour as gardeners and towards each other, and lay down benefits and eligibility. There is some suggestion from the form of words used that the fraternity was merely restating existing rules in a new minute book. For example, article decimo quinto (15) contains the leading phrase 'in respect there is frequently a thin Meeting', which suggests the article is an amendment based on experience. The entry money for a gardener was a Merk (13 shillings and 4 pence Scots or around one shilling Sterling) but gentlemen paid half a crown (2 shillings and 6 pence). The gentleman member was there to learn topical methods and cultivation to apply to his estate. An undated (eighteenth century) later article emends the entry money to the advantage of 'labouring gardeners': they paid 5/- and gentlemen 10/- Sterling. The fraternity was based in Haddington where they purchased a property on a corner in Market Street. It contained an inn, which is still known as the Gardeners' Arms today. 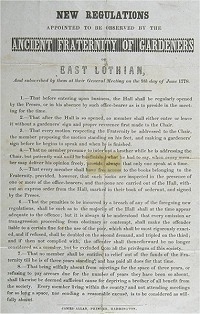 However, the membership was predominantly resident at their workplaces on the estates surrounding the town and nearby Dunbar (members there petitioned to be allowed to meet in that town owing to the difficulty of appearing at Haddington; as they were liable to fines for non-attendance the compromise was accepted). Their main meeting hall above the Gardeners' Arms was used for business meetings, dinners, and lectures as well as to store documents and their moveable property. The fraternity elected officers from the first. A chairman (sometimes called President or Preses) and an unknown number of Joint Masters are the first to be noted, together with an appointed Clerk. In the middle of the eighteenth century a Box-master (treasurer) was necessary. In the nineteenth century the officers' titles included Grand Master (President), Depute GM, Treasurer, Secretary (formerly the Clerk), as well as Keyholders (treasurer's assistants), Guards and Stewards. All can be identified in regalia purchased from the Edinburgh silversmith George McHattie in 1825-6. The senior positions and junior positions were vacated annually, but the more administrative posts of treasurer and secretary could be held for considerable periods. Also during the nineteenth century the Fraternity became commonly known as 'the Ancient Fraternity of Free Gardeners of East Lothian' reflecting both their seniority amongst a growing number of similar societies and the ever-increasing preponderance of non-gardeners amongst the membership. Despite this, the fraternity maintained from 1772 an annual programme of two competitions, extended to six during 1847. The programme was maintained (not without difficulty) until 1939. The fraternity acquired traditions over the years. Many of them parallel the practices of freemasonry, to which free gardening bears a superficial comparison. Thus members were differentiated by degrees. Master and Prentice appear in the 1676 constitution and mention of 'Servants' may indicate the intermediate degree of journeyman. All members possessed a 'Word', which was used to identify them where they might be unknown and to gain access to formal meetings. How essential this was in the restricted world of East Lothian horticulture is open to question. The fraternity paraded through Haddington before their annual dinner led by the town piper and a costumed 'Jock in the Green', who carried a bower of flowers to represent the Garden of Eden. For many years 'Jock' was the sole prerogative of succeeding members of the Nisbet family. Flower shows and quarter meetings were also usually celebrated with a meal. The fraternity had a seat, or box, in Haddington parish church, painted 'a neat green colour' and decorated with painted flowers. The box was shrouded with black cloth when a member died. They also appear to have taken the lead in a number of tree planting ceremonies celebrating Queen Victoria's long reign and participated in the customary public activities of the town. On public occasions the members wore long gardener's aprons made of blue serge cloth. Two sets survive, one plain and one with gold fringes and embroidered devices that match a set of superlative sashes. The officers wore the sashes and the devices denote their position - halberds for Guards, bunches of grapes for Stewards, a briar rose for the Depute Grand Master, and the last crowned for the Grand Master. In addition there were the silver insignia mentioned above. These were worn on blue neck collars. The Fraternity commissioned decorative jugs from a nearby pottery for private occasions and their important documents were kept in a box with an identifying brass plaque on top (their third box, commissioned from a local cabinet maker by a minute of 13 December 1815, survives). 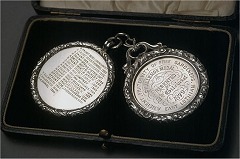 Medals and trophies were acquired for the competitions. With time, new members were attracted to the fraternity for the benefits it provided; the constitution allowed them as 'gentlemen' members - the 'free' gardeners. Scales of sickness benefit and annuities were published and if men, of any profession, could meet the fees while they were working then they received regular payments when in need. The fraternity's death grant not only covered the immediate costs of a funeral but also the needs of 'distressed widows or orphans' for a few weeks. For many years the fraternity earned income from its accumulated funds by making loans to members 'from the box'. In terms of a resolution passed on 22 February 1953 the 23 surviving members of the fraternity were unanimous in agreeing to wind up the organisation. Mindful of their rich history, their minute books were deposited in the National Archives of Scotland (until such time as proper accommodation could be found in Haddington). The regalia were passed to the East Lothian Antiquarian Society for preservation; trophies and property were returned to the donor families or presented to individuals. For more than 277 years the fraternity had regulated the profession of gardening in East Lothian. At first its members took care to ensure that knowledge and new varieties of plants were spread amongst the membership and that entrants to the profession were suitably qualified and diligent in their working life. They looked after their poor, sick and the dependants of deceased members. Later, this aspect became the main attraction of the fraternity and the membership widened beyond the gardening profession, although they maintained some of their colourful old traditions. The introduction of state benefits and the Welfare State during the twentieth century reduced universally the demand for friendly society benefits and the declining membership voted to bring their unique society to a close.